Here’s an interesting fact for beer drinkers: Amsterdam pays their alcoholic street cleaners 10 Euros, tobacco, and 5 cans of beer for a hard day’s work. Before you picture what an awesome Christmas party they must have, here’s another fun fact – beer color alone is not a good indicator of its body, alcohol and calorie content. Beers exhibit a wide range of colors, but color doesn’t necessarily correlate to calories or alcohol content. Light beer refers to beers with lower alcohol and/or calorie content in comparison to regular beer. Beer drinkers who prefer to drink more without getting intoxicated or want lower amounts of calories and carbohydrates would prefer light beer. Popular light beers in the US include Bud Light with an alcohol content (ABV or alcohol by volume) of 4.9% and 143 calories in 12 oz, and Miller Lite, which has 4.2% ABV and 96 calories per 12 oz serving. It is important to note, however, that in the US there is a stronger emphasis on reducing calories as opposed to alcohol content in light beers. A light-colored beer does not necessarily mean that it is a light beer. There are highly carbonated, pale-colored beers with a high ABV and a high calorie count. For example, Victory Brewing Company’s “Golden Monkey” is an extremely pale-colored, Belgian-inspired tripel (a style of beer) with 9.5% ABV. 12 ounces of this beer would have over 300 calories. 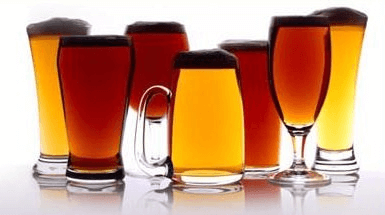 Many beer experts believe that for most light beers to contain both less alcohol and calories, they have to be watered down and be stripped of flavor, body and aroma. In addition, experts say the differences in calories and alcohol content between light and regular beers can be easily burned off with a 10-minute walk or 30 minutes of sleep. Dark beer is a type of beer that usually has a fuller flavor, in addition to higher alcohol content, calories and carbohydrates. It is a stronger brew compared to its light counterpart, and often more filling while leaving a strong aftertaste that lingers on the taste buds. Dark beer has a more complex mix of ingredients compared to light beer. Its ingredients can vary from fruits, coffee, chocolate, nuts and biscuits. It is not the usual beer of choice for many drinkers, but it is highly favored amongst beer enthusiasts who would prefer to sip and savor their beer. Dark beer is ideal for colder weather, as it can warm up the body. Most dark beer enthusiasts prefer their beer complemented by hearty stews and red meat. Chocolate and coffee-inspired dark beers are sometimes served alongside cakes made with the same ingredients. Porters and stouts are the “lightest” of the dark beers, with ABVs ranging from 4% to 5.5%, with moderate carbonation and body. Both porters and stouts have a roasted, malty taste with hints of chocolate, mild coffee and toffee. Porters usually have a touch of sweetness from the molasses and caramel, while stouts are dryer, stronger and richer in taste, while darker in color. So, what’s the difference between light and dark beer? Casual beer drinkers would usually think the color of the beer indicates whether it is a light beer or a dark beer. However, what beer color actually shows is the brew’s malt content. The higher amount of malt in the beer, the darker the color will be. Light beer usually contains less alcohol, calories and carbohydrates. Light beer drinkers prefer this beer style because it is less intoxicating and not as filling as dark beer. On the other hand, dark beer generally has more alcohol and calories, as it has more ingredients. Dark beer is characterized by well-loved full, complex flavors and aromas. Light beers are refreshing and easy to drink, while dark beers are usually heavy and best when sipped and savored. Light beer is best for parties, social gatherings and outdoor activities while dark beer is ideal indoors, during colder weather and after a good, hearty meal.